As part of the Foodie by Glam featured author program, I’m sharing a recipe today featuring Mazola Corn Oil. Did you know that corn oil can be part of a sensible, heart-healthy diet? It can, and Mazola makes it easy by sharing tons of mouth-watering, heart healthy recipes on its website. Being from the South, I grew up eating lots of fried foods…so they’re some of my favorite comfort foods to this day. As an adult I still like to enjoy crispy, crunchy fried foods…but I try to do so as healthfully as possible. One of my favorite techniques to save fat and calories – but still enjoy the crunchy texture I crave – is to oven fry. This method allows me to use less oil and still enjoy my favorite fried foods, with less guilt. My Baked Confetti Chicken Taquitos with Cilantro-Lime Ranch are a perfect example of this method. Rather than deep frying my taquitos in oil, I simply brush them with a bit of Mazola Corn Oil and then bake them in a hot oven until they’re crispy and golden. Other heart-healthy ingredients I used in this recipe include fresh pico de gallo, fat-free Greek yogurt, and 2% pepper jack cheese. These ingredients saved both fat and calories, but they didn’t skimp on flavor or texture. The filling for my taquitos is moist and bursting with spicy flavor. This recipe makes enough filling for a dozen taquitos – plenty for a family of four. However, I made 8 taquitos since it’s just Michael and I. Bonus: I had enough of the flavorful filing left to make quesadillas the next evening. If you prefer your Mexican food on the milder side, simply use shredded cheddar or Colby-jack in place of the spicier pepper jack. Step 1: Preheat the oven to 375. Line a large rimmed baking sheet with parchment paper; set aside while you prep the taquitos. Add the chicken, cheese, corn, pico de gallo, Greek yogurt, cilantro, cumin, and salt & pepper to a large mixing bowl. Stir with a sturdy spoon until the mixture is completely combined. Step 2: Spoon 1/3 cup of the mixture along the bottom of each corn tortilla and roll up. [NOTE: This will be easier if you wrap the tortillas in a damp towel and microwave for 1 minute]. Secure each taquito with a toothpick and place on the baking sheet. Brush the tops and sides of each taquito with Mazola Corn Oil using a pastry brush. Sprinkle the taquitos with chili powder and salt & pepper. Bake for 10 minutes, then flip the taquitos so the bottom side is facing up. Brush with more Mazola Corn Oil and bake an additional 5 minutes. Step 3: While the taquitos bake, make the dipping sauce. Combine the ranch dressing, cilantro, and lime juice in a small bowl. Refrigerate the dipping sauce until you’re ready to serve. Place the dipping sauce in the middle of a serving platter, and arrange the taquitos around the sauce in a spoke pattern. I like to serve them with guacamole, chips, and salsa at the table…but Spanish rice and/or beans would make nice additions too. 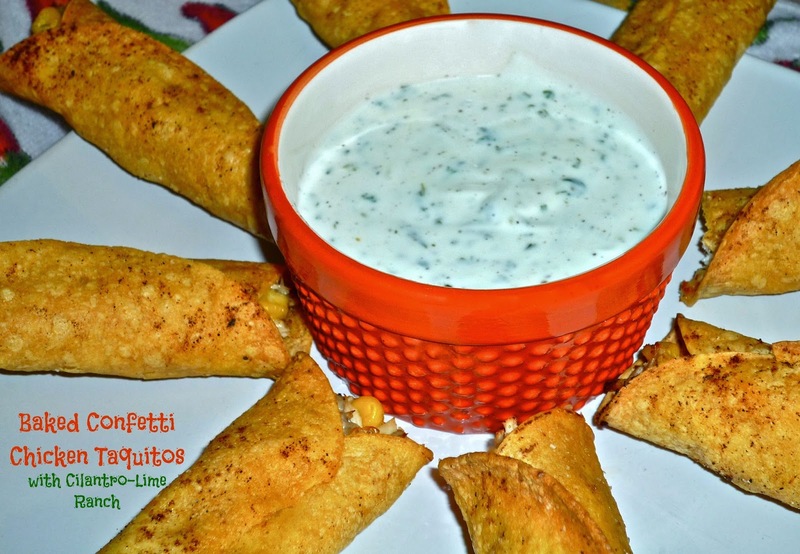 We absolutely loved these flavorful taquitos! They baked up crispy and light with the Mazola Corn Oil...not the least bit greasy. The pepper jack cheese and pico de gallo provided a nice spicy kick, the corn provided a bit of sweetness, and the Greek yogurt kept the filling moist. We loved the zesty flavor of the cilantro-lime ranch dipping sauce too. These taquitos make a great family-friendly meal…or a fun appetizer for your upcoming March Madness or NBA game-watching parties. Big flavor AND heart-healthy? That’s a double win, my friends! In fact, a new study shows that Mazola Corn Oil lowers cholesterol more than extra virgin olive oil. Try it today for sautéing, stir frying and baking. Go to Mazola.com to learn more.